Italy’s Fides Inversa (which includes some highly-experienced names from the Extreme Metal scene!) debuted in 2009 with the Osmose Productions-released full length Hanc Aciem Sola Retundit Virtus (The Algolagnia Divine). 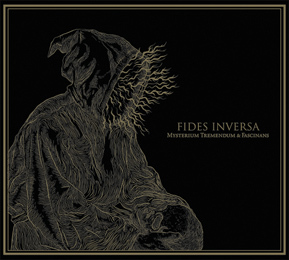 Since then, there were no more official releases, but Fides Inversa played live all over European soil. Now, finally, it is time to experience this band’s second opus, and their debut for top-label World Terror Committee aka W.T.C. Productions. Imagine Wormreich covering a Gorgoroth-piece, or Svartsyn and Misteltein joining forces with Deathspell Omega, and you might have quite an accurate idea of what Mysterium Tremendum Et Fascinans stands for.